Volant Cold Air Intake w/ Ram Air Scoop 2009-2013 Chevy Silverado GMC Sierra (1500 Only) 4.8 5.3 and 6.25AdamJanuary 5, 2015Instructions could have been easier to read. Perhaps more detailed photos in color. Install was fairly simple, ram tube sits nicely. Noticed significant increase of low end torque pulling my trailer. Great product!! Volant Cold Air Intake w/ Ram Air Scoop 2009-2013 Chevy Silverado GMC Sierra (1500 Only) 4.8 5.3 and 6.25Shanon LeeSeptember 23, 2012Could use better instructions. Wasn't hard to install. I ordered the lower tube. This was left off because it comes out below the front air dam on front bumper. I see a huge problem there if you encounter a flooded intersection etc. Getting ready to take a trip and see how much it helps mileage. Cold air intake systems aren't created equal and savvy customers know it. This is why Volant Intakes are so popular with customers who know their air intakes. What makes Volant Cold Air Intakes different? First, Volant eliminates your restrictive factory airbox, filter, and intake tube. In its place goes the Volant Power Box. This box houses a high flow Volant Air Filter that is cleanable and reusable for as long as you own your vehicle. This superior design protects the filter and ensures that colder air is pulled instead of hotter (less dense) air from the engine bay, resulting in more horsepower and torque. Connected to the box is the Volant Ram Air Scoop, which turns your intake system into a functional ram air system to maximize horsepower and mileage gains, especially at higher speeds. Being an enclosed system, it keeps your engine quiet at cruising speeds, but allows it to still roar to life when you stomp the gas. This, coupled with the fact that Volant Cold Air Intakes incorporate your existing sensors, mean you won't have any check engine lights and they are safe for use on your vehicle. This "Factory Tuned" design means you won't need any tuning and makes this truly a bolt on system. Everything you need to install the unit comes with your Volant Cold Air Intake and you'll be able to install it with basic hand tools in an hour or less. Volant Intakes all are backed by a lifetime warranty. Volant Cold Air Intake Systems exceed OE standards and as a result will not void any existing factory warranties that you may have. Additionally, you'll enjoy increased horsepower and torque, as well as improved throttle response. Fuel economy gains, especially during freeway conditions, are commonly achieved helping the unit to pay for itself over time. 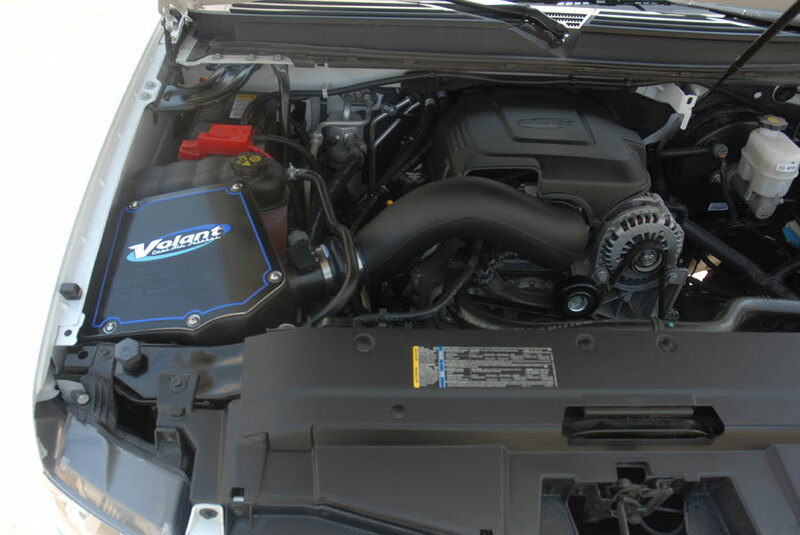 The part number for this Volant Complete Ram Air Intake System is 353532 and it fits 2009-2013 Chevy Silverado GMC Sierra (1500 Only) 4.8 5.3 and 6.2 models. This Volant intake is 50 state legal. It is covered by CARB Exemption Number (also known as an EO Number): D-526-4 . If an emissions inspection facility ever questions the legality of this Volant Cold Air Intake System, you can provide them with the CARB EO Number above.